This image, taken from the CAIC, shows the Senator Beck Mine area north of Silverton and east of Telluride where the first fatal avalanche of Colorado's season occurred. 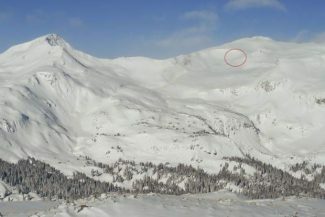 The red circle in the upper right corner is the rough location of the fatal slide. There is a dirty little secret in the world of backcountry skiing and avalanche safety. It has to do with death, danger and the risks that even experts sometimes ignore in pursuit of a powder day. Avalanche and backcountry safety lies at the intersection of several different factors, from proper equipment to weather conditions, but the factor that is arguably most significant is education. From the most basic avalanche awareness presentations, which are often held in ski towns across the state at the start of the season, to the highly advanced and technical aspects of an AIARE Level 2 course, education is the key that opens doors into the backcountry. As valuable as avalanche education can be, it is also something of a double-edged sword, leading people to make more dangerous decisions. That is why it is important for even educated or expert backcountry recreators to review the more advanced strategies that can keep them safe. While research on the topic is sparse, a study from the National Outdoor Leadership School in Wyoming showed that roughly 44 percent of all groups who triggered avalanches had at least one individual with formalized avalanche training. The same study showed that just 30 percent of all groups who triggered avalanches had no training or awareness of the dangers. Avalanche educators like to tell AIARE Level 1 attendees that they are more likely to be caught in an avalanche after attending the course than before. Avalanche education in this sense can be dangerous, giving backcountry skiers a false sense of security that sometimes leads people to try and dodge danger rather than avoid it entirely. There is an insider’s term for this type of dangerous thinking: it’s called an expert halo. Colorado’s avalanche season so far this year offers striking examples of how this can play out, with deadly consequences. At roughly the half-way point for the current ski season, there have already been 13 avalanche deaths in the United States, just over half the total from last season and one more than was seen during all of 2016-17. Of those 13 deaths, two occurred in Colorado. The problem is likely only going to grow in coming years as the popularity of backcountry excursions expands by leaps and bounds. According to data from the Snowsports Industries America, the sale of alpine touring boots doubled between 2012 and 2016. Likewise, splitboards saw a six-fold increase in sales between 2009 and 2012. The 10th Mountain Hut Association reported a 15 percent increase in bookings between 2001 and 2013 while the U.S. Forest Service tallied a 64 percent increase in permits for the Vail Pass Backcountry Recreation Area between 2002 and 2011. Both of this season’s fatal avalanche events occurred in January and involved groups of highly experienced and educated skiers. The first occurred in the San Juans and was actually triggered by a group from the Silverton Avalanche School taking an AIARE Level 2 course. The AIARE Level 2 class is generally the most advanced level of avalanche education non-professional backcountry enthusiasts take. The avalanche occurred in the Upper Senator Beck Basin not far from Silverton. The incident, which was technically two separate avalanches, caught all six members of the class and buried and killed one of the students. The class was well prepared for the trip and well educated with pre-planned routes, pre-set decision points and a planned descent route. Moreover, the skiers caught in the avalanche were experienced and equipped with the appropriate gear and their instructor had extensive first hand knowledge of the local snowpack. Colorado’s second fatal avalanche of the season occurred on Jan. 21 near the Markley Hut south of Aspen. On that day, a skier, part of a duo, triggered a persistent slab avalanche and was buried. The married father of one, whose wife and child were in the nearby Hut at the time of the incident, was wearing appropriate safety gear and was quickly uncovered by his partner, in roughly 10 minutes, but perished all the same. The two men involved in the Markley Hut avalanche were experienced skiers and reasonably knowledgeable. The avalanche report from the Colorado Avalanche Information Center on the Markley Hut fatality notes that the two men were “risk adverse” and that their goal for the day was to enjoy a day out touring and to descend on safe, soft snow back to the hut on the last day of their trip. Staying safe in the Colorado backcountry requires much more than just the purchase of a beacon, shove and probe or the attendance of an avalanche course. It requires meticulous and structured planning, a cautious mindset that constantly seeks to reevaluate conditions, and a willingness to simply say no to skiing a specific slope. More advanced backcountry travelers can learn much from the Silverton avalanche incident, which provides an almost textbook example of how to address backcountry travel alongside a tragic example of how even the most cautious and intelligent travelers can encounter danger. If you plan to travel into the backcountry this winter prepare ahead of time. Make a comprehensive plan based on weather conditions and the avalanche forecast for the day that includes your group’s goals, such as skiing a particular chute or simply enjoying low angle powder meadows. Develop a route plan for how to reach your goal. As part of a route plan backcountry travelers should include waypoints and decisions points, or locations at which the group will decide to continue on course, turn around, or take a different route. You should also try to determine slope angles on any slopes you plan to ski. When traveling through the backcountry groups should constantly be reviewing and considering the local weather conditions, wind patterns, temperature fluctuations and any observable slides. Make a communications plan ahead of time, especially for the brief periods that groups will be split up while descending backcountry slopes. When preparing to head downhill pause and discuss each slope before proceeding to ensure every member of the group feels safe. Talk about terrain traps, trigger points and islands of safety and do not be afraid to discuss how the group will handle an avalanche if it occurs. If possible try to travel in the backcountry with more experienced and educated travelers, though remember of dangers of the expert halo and do not be afraid to voice your opinions or concerns. At the end of the day an avalanche cannot be outsmarted. It can only be avoided. That goes doubly so for the experts who can find themselves on more remote and dangerous slopes.